I own two power chairs. One is portable and the other is heavy-duty. Due to limited space in my home, the heavy-duty chair has been stored at my parent’s house. I never use it and it just sits in their dining room taking up space. My parents didn’t mind it staying there, but it bothered me. So last week I decided it has been at my parent’s house long enough and it was time to sell it. So, what did I do? I took some pictures of it and tried to sale it on Facebook. I thought it was a good idea, but apparently…no one else did. Not one call. Plan B was to give it away. I wish I had done that from the start. I connected with my local MS Society and they gave me some leads of people who were in need. 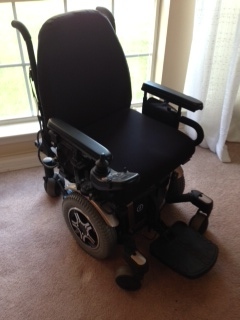 After a few days, I was able to connect with a fellow MSer who needed a power chair. I recruited my dad to handle the specifics and the actual transfer of the chair. He’s good with that kind of stuff. The man resides roughly two hours from my parent’s home, but was happy to make the trip. He was so appreciative. Who knew how rewarding helping someone would be. I am glad you were able to make such a dramatic change in a person’s life. I know I feel good about what you did and I didn’t even do anything. Good for you! Bless your heart! I know what it feels like to receive something I know I would not have been able to afford. I received my scooter the same way. A fellow MSer advertised in the MS classified and I responded. My son and I drove about an hour and a half to pick it up. I was truly grateful. You give yet you are given. Small acts of kindness aren’t small! Thank you for sharing this Nicole! Random Acts of Kindness make such a difference in this world. How wonderful for you to share your blessing with others — and thank you for reminding me what I need to do with my unused equipment! That was a lovely gesture Nicole..and one you’ll never regret. ” Blessing” him will ” bless you!” I love your writing and wish you every good and wonderful thing! God bless you! Yes blessed to be a blessing. That is so blessed! What a great feel-good story this is!